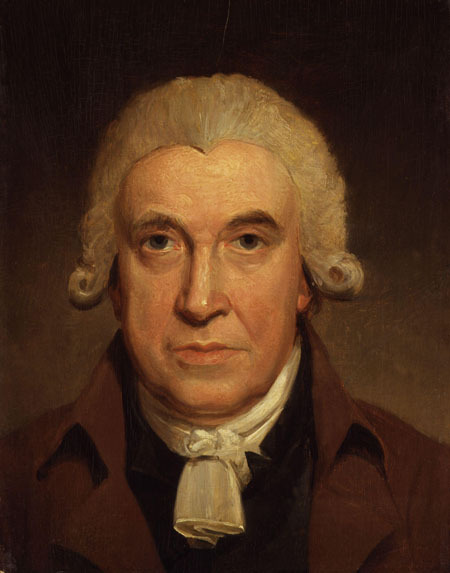 James Watt was born at Greenock, Scotland, on January 19, 1736. Throughout his life he suffered from debilitating migraine headaches, a misfortune that hindered his education. As a boy, he worked in his father’s workshop and developed great mechanical skill; from 1753 to 1757, he learned the trade of mathematical­ instrument maker in Glasgow and London. He then set up a shop at the University of Glasgow for the fabrication of compasses, scales, quadrants, and other such equipment. In 1764 Watt was asked to repair a working model of the steam engine, invented in 1705 by THOMAS NEWCOMEN. Watt began investigating the properties of steam and the operation of the engine; the following year he had the idea of adding a separate, cooled condenser to the engine. He built a model incorporating his new design, and the resulting steam engine exhibited increased thermal efficiency and reduced operational cost. He was granted a patent for his steam engine in 1769. Following financial difficulties in 1774, Watt formed a partnership with Matthew Boulton, owner of the Soho Foundry near Birmingham, England. For the next 25 years, Watt’s steam engines were manufactured at the Soho Foundry. During that time, Watt introduced many improvements to his engine: the sun­and­planet gear wheel (which convened reciprocal motion to rotary motion); a parallel motion mechanical linkage (which made possible a double­ acting engine); an automatic centrifugal governor (which regulated steam); and a steam indicator (which measured steam pressure and degree of vacuum). Watt coined the term “horsepower” to rate the work capabilities of his engines over time and standardized the use of the term as a unit of power. In 1800 Watt’s patent expired and he retired to Heathfield Hall, near Birmingham, where he died on August 25, 1819. Watt’s improvements to the steam engine helped to push the Industrial Revolution forward and transformed life in industrialized countries. Watt’s engine allowed factories to be built away from rivers and streams, the primary source of power for industry in Watt’s time, and closer to key transport routes, raw materials, and other resources. This enabled manufacturing to develop in the Midwest of the United States. As the steam engine changed the energy base of manufacturing from stream power to coal, it made Britain, which possessed vast reserves of coal, the world’s richest industrial power during Watt’s lifetime. The Watt engine was more efficient and less costly than its predecessor and offered a practical source of power to many industries. After the incorporation of Watt’s sun­and­-planet gear wheel and the conversion to rotary motion, the steam engine was adopted for textile manufacture. It had previously been used only for pumping water in mines, salt works, and iron works. Watt’s work also influenced the founding of thermodynamics, the study of heat. In addition, the precision of his designs and manufacturing techniques raised engineering standards. Watt represented a model of the connection between objective scientific research and technological development. Prior to Watt’s investigation of the steam engine, JOSEPH BLACK had introduced the concept of latent heat, the heat lost or absorbed when matter changes state (for example, when liquid becomes solid or gaseous). Watt learned of Black’s concept, and he discovered that significant latent heat was wasted in Newcomen’s steam engine. Watt set the agenda for the development of all subsequent heat engines and demonstrated the importance of economizing heat in the operation of all engines. Watt’s steam engine was a milestone in the development and proliferation of machine­ powered manufacturing and transformed the conditions of life in industrialized countries.